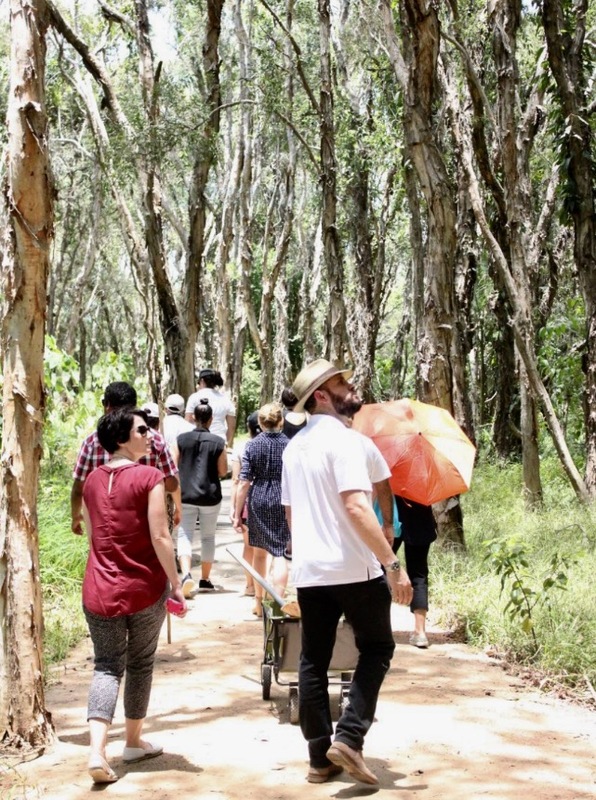 The Nyanda Cultural Tours offer a way for visitors to uniquely experience a connection to this culturally significant place located so close to the City of Brisbane, Australia. *Nyanda is the Yagara word for waterhole or lagoon. Whether you’re a local; here on business, or visiting … we’re looking forward to meeting you. We invite you to spend some time with our Aboriginal tour guides who will lead you around Brisbane’s Nudgee Waterholes, Bora Ring and Bush Food Gardens site. During the 1.5 hour visitor tour, you will be able to participate in a smoke ceremony; taste seasonal bush foods and see where witchety grubs live; participate in weaving and ochre-making demonstrations; view a fossilised spear that was discovered here; and listen to a bull-roarer at the sacred Bora Ring. A bush foods morning tea will also be served as part of this tour, including wattle seed damper with rosella, wild lime and lilly pilly jams; and our very own special Nyanda lemon myrtle cordial.